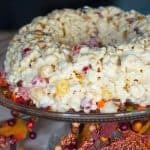 Harvest spice popcorn cake is the perfect fall treat. 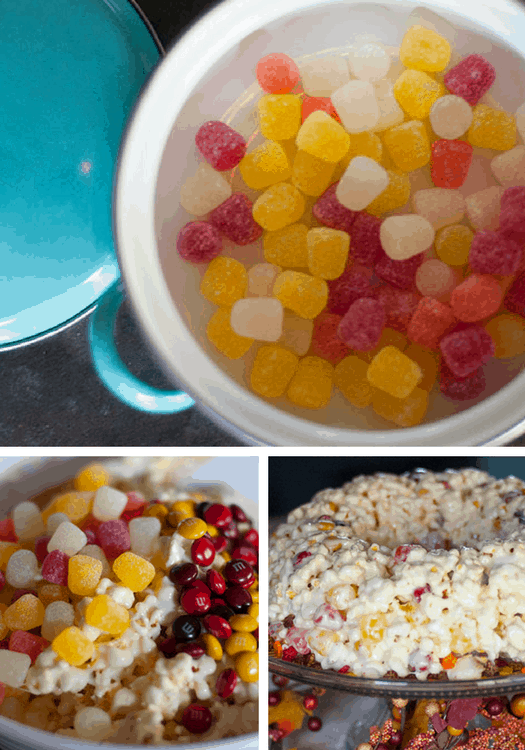 Melt marshmallows and butter, fold in popcorn and load with spice drops and m&ms. Hello and welcome! Today’s recipe is tailored to my favorite time of year — fall. You can’t beat autumn colors, fall comfort foods, and cozy sweaters. Speaking of comfort foods, this recipe is especially comforting. It’s a recipe my Mom makes often when we go back home to visit. The best recipes, in my opinion, bring back warm memories and create traditions. This one especially gives me the warm and fuzzies. I hope you enjoy! 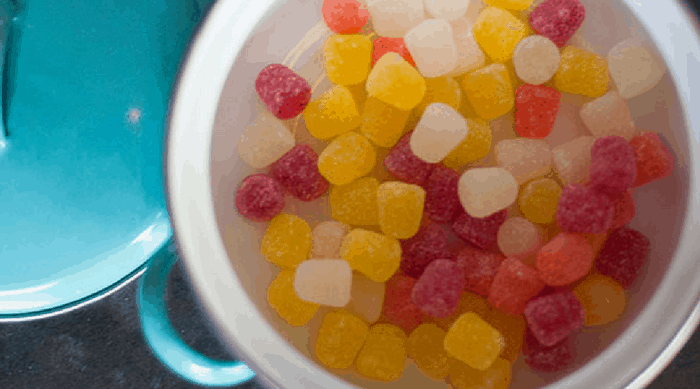 In a medium to large sized bowl, add the 6 tbsp butter and miniature marshmallows. Melt in the microwave in small increments, stirring often. The marshmallows should be smooth and the butter should be completely mixed in. 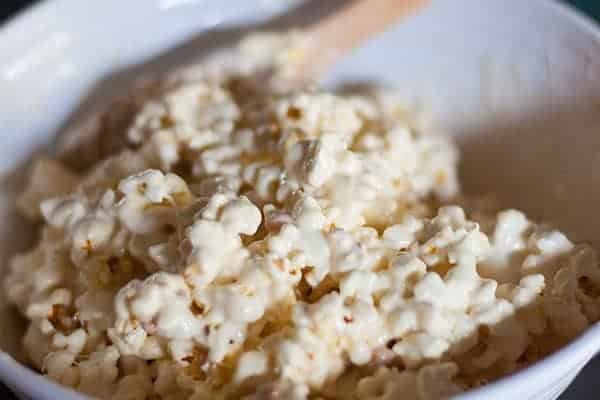 Next, add the popcorn and mix well. I used 2 bags of microwave popcorn, which is approximately 10 cups. You can find harvest colored M&Ms, so no need to pick out special colors for those! Fold in the spice drops and M&Ms. Grease a bundt pan. Also, grease your hands and add the popcorn to the pan, pressing down firmly. Turn the bundt pan over on to a plate or serving tray. I used my cake stand (which is also a punch bowl). Which I LOVE and use often. Decorate the edges with autumn sprinkles. Enjoy! 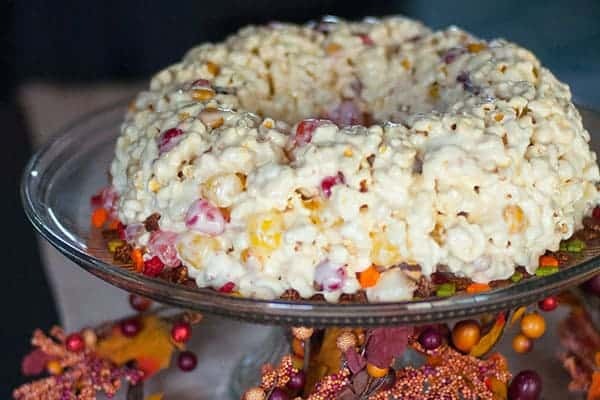 Popcorn cake loaded with spice drops and M&MS is the perfect treat for fall, Halloween or Thanksgiving. 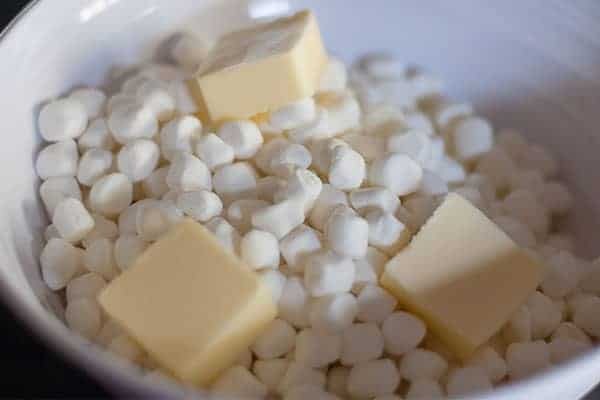 In a medium-sized bowl, add the butter and miniature marshmallows. 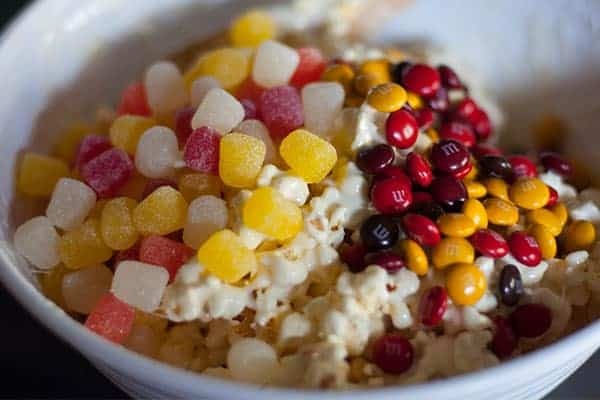 Add 10 cups of popcorn and mix well. 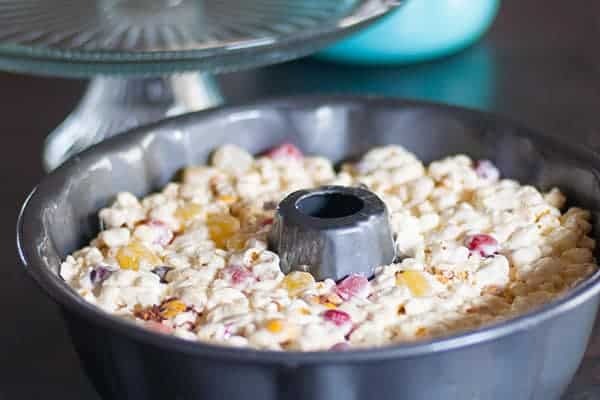 With greased hands add the popcorn mix to the pan and press down firmly. Turn the bundt pan over on a plate or serving tray. Decorate edges with autumn sprinkles. Optional. You can also add peanuts. Looks really good. My wife is making a list of “fall treats” now that the weather is cooling down here. I have never heard of this before. My problem would be eating all the ingredients before they are even mixed together! I know, right? 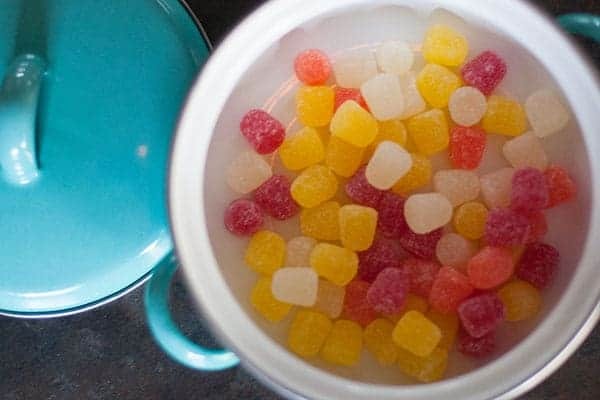 You definitely need to test them before mixing it all together. 🙂 Thanks for stopping!